Online privacy is a hot topic these days, especially after the recent news stories about giant data breaches exposing millions of individuals’ personal information. The natural response is to want to protect yourself by deleting everything about you from the Internet. But, is this really possible? The short answer is no—but that doesn’t mean there’s nothing you can do. 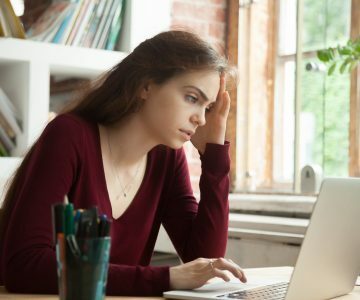 There are steps you can take that will significantly reduce the amount of personal data about you on the Internet, providing you with important protection against identity theft, privacy violations, online stalkers, and other threats. In this article, we’ll show you some essential online privacy precautions that everyone should follow, no matter who they are or what their concerns. We’ll also provide you with information on some of the more drastic removal steps you may want to consider. Minimize disclosures: Don’t give out any information unless you have to. When you’re creating a profile or signing up for a service, only provide what’s absolutely required. Be an imposter: Whenever you need to create an online username or profile, use an alias and an anonymous or throwaway email address. This prevents your online activity from being tied to your real name. Be aware what your online actions are telling others: Every time you “like” something or “upvote” an article, you are adding to the databases of companies that created those buttons. You are also giving away your physical location when you “check in” somewhere. Turn off geolocation tracking: Chances are, your smartphone is sending information about your physical location on an ongoing basis to any number of online services. Update your phone settings to turn off geolocation tracking. Review your app permissions: Many people automatically click “accept” whenever a smartphone app asks for permission. But many of these apps will actually work just fine without access to your address book, location, and other personal information. Review each privacy request carefully and reject as many as possible. Even if you post nothing yourself, chances are lots of other people are posting information about you online for their own purposes. The next step, therefore, is to locate as many of these third-party posters as possible, and then take steps to stop them from sharing your information. Google yourself and see what kind of search results come up. If you have a generic name, it’s a good idea to Google different versions of your name, name + employer, name + city, and any other combinations that might bring up results about you. Make sure you examine the first three pages, as well as the image and video tabs, because they might contain personally identifying information too. Then, make a list of where your information is appearing. People-search sites: There are hundreds of these types of sites on the web. They make their money selling your address, phone number, and birth date, and other vital information. Social media platforms: Sites like LinkedIn, Facebook, and Twitter are often at the top of the search results for someone’s name. Once someone clicks on your profile, that person gains access to information like the places you’ve lived, where you’ve worked, and the names and profiles of all of your friends. Of course, there are many other places your information may appear. Make sure to include every website that mentions you in your list, even if you’ve never heard of it before. If it’s in your search results, it’s worth addressing. If your Google search reveals that data-broker sites (also called people-search or whitepages sites) are posting your information, then you will need to ask them to remove it. These websites constantly scan the web, looking for information about you that they can collect and sell. Some of the biggest people-search sites include Spokeo, US Search, Intelius, MyLife, Radaris, Whitepages, and PeopleSmart. For specific instructions on how to get these companies to do so, see our in-depth article How to remove yourself from the top people-search sites. Outdated content that remains in the Google cache: To delete these items, go to the Remove outdated content page, paste in the URL of the page that contains the outdated content, and choose “Request removal.” Depending on the specifics of your situation, you may need to enter more information or go back and forth a couple of times with Google. Copyright violations that fall under the Digital Millennium Copyright Act: If someone is posting information that you have copyrighted, you can ask Google to remove it via its legal removals page. Legal orders from a court of law: Use the legal removals page to delete search results that a court has ordered taken down. Personal information that poses certain risks: If you want to remove search results containing information ( such as your social security number, bank account or credit card number, or medical records) that poses a significant risk of financial fraud, identity theft, or other certain dangers, use the Remove information from Google page. Many of the actions we suggest below cannot be undone. This means you could lose valuable information and any status you’ve earned from your online presence. There’s nothing stopping someone else from putting information about you online without your consent. This is why privacy protection coupled with a proactive online reputation management plan is usually the better option. The lack of a digital footprint can hurt you professionally and even hinder your ability to get a job. If you change your mind about closing an account, you might not be allowed to restart it with your previous name or email address. You should also ask yourself why you’re doing this. Are you being harassed, or are you in danger? Or, are you just trying to reduce the impact of technology on your life? Make sure you understand what issues you are trying to address so that you can tailor your approach to resolving them. There may a better way to tackle your problems. If you need assistance figuring out the best course of action, you can always call ReputationDefender for advice, free of charge. Social media platforms like Twitter, LinkedIn, Facebook, and Instagram contain lots of personal information about you, and thus, expose you to many risks. If you’re certain that you won’t need these accounts for anything in the future, you can go ahead and delete your accounts. 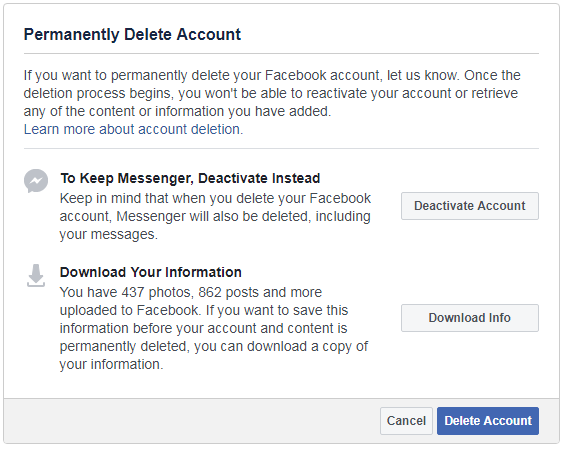 Go to Facebook’s Permanently Delete Account page. Click “Download info” to save a copy of all your information (like your posts and photos). After you delete your account, these items will be inaccessible. It may take up to 90 days to remove all your information. However, during this time, your information will not be visible to other users. Go to your Twitter account settings page. Select “Deactivate Your Account” at the bottom of the page. Log in and click on “Me” in the upper-right corner. Choose “Closing your LinkedIn account” and fill out the required fields. Log in and go to the Delete Your Account page. From the drop-down menu, select the reason you are deleting your account. Shopping sites and other websites you do business with track your online actions and may store your financial data. To reduce the odds of this information falling into the wrong hands, you can close any accounts you have with these sites, especially if you no longer use their services. Note: Make sure you download any digital files you store on these sites before closing accounts, otherwise you may lose them permanently. Log in and make sure you don’t have any outstanding orders. Select Help > Need More Help > Contact Us. Scroll down the page to select “Login and security” from the drop-down list under item number 2. Select “Close my account” from the drop-down list. Chat: Wait until a customer service representative comes online. Then, tell him or her you want to close your account. The most drastic step you can take to remove yourself from the Internet is to delete all of your email accounts. However, you’ll need to use an email address to complete the previous steps, so be sure you have deleted all of your other accounts before you do this. Back up your emails up somewhere, so that you still have access to them. 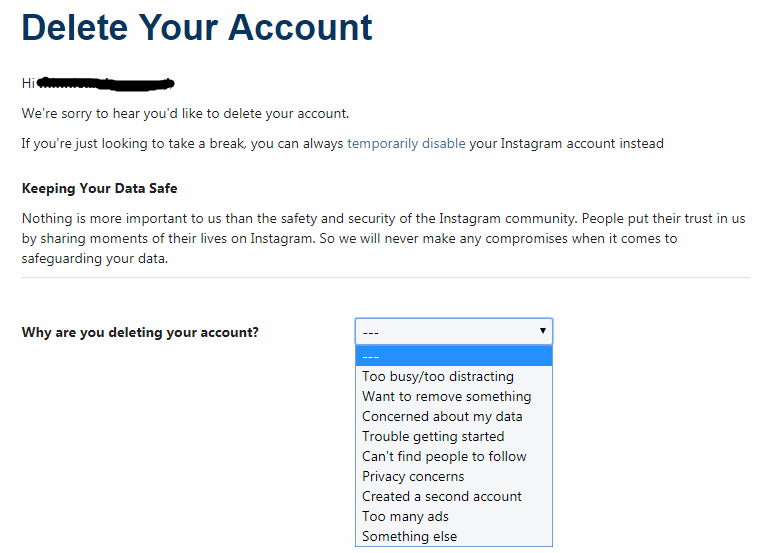 Find the option to close or delete your account. Remember, there is a reason that even those of us with nothing to hide put locks on our doors and curtains on our windows. Privacy is an essential component of our human dignity and personal safety. Just because what we care about protecting is online, doesn’t make it any less OURS.